SHANGHAI — Authorities in Shanghai will raise the city's retirement age to relieve pressure on the pension fund as they struggle to cope with an ageing population and falling birth rates, state media said Tuesday. Vice Mayor Hu Yanzhao said the city's pension fund had fallen into a deficit as more than a fifth of the population had reached the end of their working lives, the Shanghai Daily reported, without giving a figure for the shortfall. "We will put off the retirement age of citizens, especially for female professionals," Hu was quoted as telling a government meeting on Monday. The retirement age is currently 60 for men and 50 or 55 for women, depending on the job, the report said. Hu did not say by how many years the retirement age would be raised, but experts have recommended five years, the report said. The number of people aged 60 and older in China's biggest city is expected to rise to 3.12 million this year, the report said. Spanish unions called Friday for demonstrations against a plan to raise the retirement age, the first hint of labor unrest since the government unveiled austerity measures to trim a ballooning deficit and restore credibility on markets rattled by the Greek debt crisis. Besides the proposal to gradually up the retirement age from 65 to 67, unions are angry with a government plan to change pension formulas. In most cases that would mean a smaller pension in a country where the average one is about euro800 ($1,100) a month. It also announced the plan to raise the retirement age to protect a social security pension fund which is separate from the budget and currently in surplus but faces troubles ahead due to a steadily graying population and longer life expectancies. Italy's Prime Minister Silvio Berlusconi is proposing raising the retirement age across the European Union, reports La Repubblica in its Friday Internet edition. "I've raised the issue of raising the retirement age...as there's a need everywhere: pensions are increasingly weighing on the finances of all states," Berlusconi was quoted by the paper as saying, on the sidelines of an EU summit in Brussels. I'm not quoting the whole thing. Bolling trying to explain that merely changing one person for another doesn't really accomplish anything... well, just read the transcript. Where in Ohio is Kucinich from exactly, and why do they keep re-electing him? The state pension age (SPA) should be raised to 70 by 2046 to reduce the deficit and offset ageing-related costs, according to a PricewaterhouseCoopers study. That would go further than current government plans, which would see the SPA increase to 68 for all by 2046. Today the SPA for men in Britain is 65, and 60 for women, although the latter is set to rise to 65. PwC calculated that by extending the SPA to 70 over that time frame, about £9bn a year in today's money could be shaved off the deficit, or 0.6pc of gross domestic product in 2046. Interesting competing lines here - on one side, asking to get rid of compulsory retirement age.... on the other, complaining about raising age for state pensions. SPANISH prime minister José Luis Rodríguez Zapatero is facing the first major union protest of his six years in power as tens of thousands of workers take to the streets to protest against his proposal to kick-start the troubled economy by reforming the labour legislation and raising the retirement age from 65 to 67. Demonstrations took place in Madrid, Barcelona and Valencia yesterday, to be followed by other towns and cities across the country throughout the week. In a joint radio interview, Candido Mendez, leader of the General Workers’ Union (UGT) and Ignacio Fernandez Toxo, head of the Workers’ Commission (CCOO) warned the government of the dangers to social stability if their proposed pension reforms went ahead, and they threatened widespread strikes, even a general strike, unless they reconsidered their plans. “They are making a grave error. Raising the retirement age goes against workers’ rights,” said Mr Mendez. The country has been in recession for the past two years, and there is little hope of it emerging this year. For years Spain’s economy was heavily dependent on construction and the real-estate boom. Once the bubble burst, so did the economy. Half-finished buildings line towns and villages around the country, hundreds of factories have closed, and shops are shuttered. There are almost four million unemployed, including 40 per cent of young people, many of whom have never been in work. Officials say that because of the unemployment rate, combined with an ageing population and a subsequent reduction in contributions, there will not be enough to pay pensions in a few years’ time. More than 100,000 people were forced to retire against their will last year as employers used the default retirement age to cut back on jobs, according to Age Concern and Help the Aged. The charity said its research suggested employers had used forced retirement as a cheap and easy alternative to redundancy during the recession. Michelle Mitchell, Age Concern and Help the Aged Charity director, said: "Our survey clearly shows the use of forced retirement has spiralled out of control, offering some employers a low-cost shortcut to shed jobs during the recession. "The default retirement age has stamped an expiry date on hundreds of thousands of older workers. It's the most disturbing example of age discrimination which still tarnishes later life for so many people." The charity's figure is four times higher than the number it expected to see when the default retirement age of 65 was first introduced in 2006. However it said it expected the situation to get worse in the near future: some 530,000 workers aged 60 and over are still working for employers who enforce the default retirement age of 65, and 250,000 aged 60 to 64 say it is likely or certain that they will be forced to retire. The workers rights: to work beyond a particular age, or to stop working at a particular age. Isn't that cake you're saving away so stomach-filling? That's a nice trick you've got there. My proposal: let people have the right to run their own business and work for themselves at any age. Then they can decide when they ought to stop working. The Government's retirement age proposals will be published later this week. Its National Pensions Framework document will detail how the raised age of retirement will affect long-serving staff compared with newer recruits. The new pensions arrangements will give different retirement ages depending on an employee's level of pension contributions, and how close they are to retirement. The pensions framework will be launched by Minister for Social and Family Affairs, Mary Hanafin, on Wednesday. Most workers in occupational pension schemes are able to retire at 65, while the State pension is paid from the age of 66. Last October, the Minister warned: "Certainly, an increase in retirement age is an option we must consider." The Government has already said in the December 2009 Budget that public servants will no longer qualify for a full pension until they are 66. New recruits to the public sector will learn the details of their pension scheme later in the year. The Department of Finance indicated in talks with unions that new entrants to the public sector could have their new retirement age set at 70. 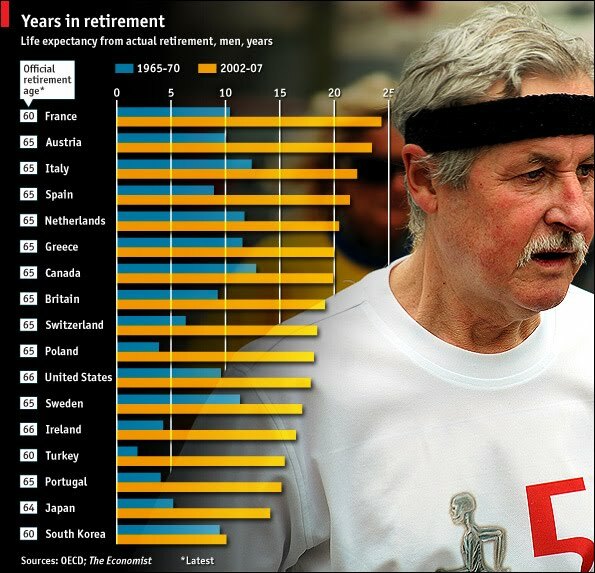 An Bord Snip had flagged that raising retirement ages was a major potential saving. Chairman Colm McCarthy has said a sharp increase in life expectancy was becoming "hugely costly" to the Exchequer and causing "huge problems" for state pension schemes. "If people used to snuff it at 70, but have decided to snuff it at 85 and 90, well then something's got to give," he said. See, look how civic those previous people were, deciding to snuff it at 70. Too bad later generations got greedy and decided to snuff it at 90. The Irish government says it's raising the retirement age for state pensions in its latest bid to reduce spiraling debts. Government plans unveiled Wednesday seek to raise the current retirement age of 65 to 66 in 2014, 67 in 2021 and 68 in 2028. Social and Family Affairs Minister Mary Hanafin says state benefits were not designed to cover people's retirement bills for 15 years or more. She says Ireland's average life span of 76 for men and 81 for women is forecast to rise by eight years within the next two decades. TAOISEACH BRIAN Cowen has said there will be “no immediate change” to the current retirement age, but has signalled that demographics may require a review in the “long term”. Speaking to reporters in Galway yesterday, where he opened the Irish Hotels Federation conference, Mr Cowen confirmed that the Government’s National Pensions Framework document would be published this week. Asked about increasing the retirement age limit, Mr Cowen said “there will be no immediate change in relation to this matter”. THIS WEEK’S announcement by the Government that the qualifying age for a State pension is set to rise, first to 66 and eventually to 68, has reignited debate among workers and employer bodies on ageing in the workplace. The bottom line, which justifies the increase from the Government’s point of view, is that we are living longer and healthier lives. So raising the eligibility age for the State pension makes economic sense for the Government and follows similar moves in countries across Europe. But what of the worker? The debate throughout Europe on raising the retirement age has been further fuelled by the fact that Europeans are having fewer children. It is said that Italy, for example, will need to raise the retirement age to 77 or admit more than two million immigrants to maintain its current workforce. Moves in Spain to raise the retirement age from 65 to 67 were met with mass protests, while in the UK David Cameron’s proposal to raise the retirement age by one year drew a mixed response at the Tory Party conference last year. A spokeswoman for the Help the Aged charity in the UK points out that current retirement expectations are anti-elderly. “The default retirement age has stamped an expiry date on hundreds of thousands of older workers. It’s the most disturbing example of age discrimination, which still tarnishes later life for so many people,” she says. Eamon Timmins, of Age Action Ireland, says we need to be careful not to confuse the age of retirement with the age of eligibility for the State pension. While many current work contracts may force employees to retire at 65, if the State pension does not come into effect until 66 or 68, there could be a significant income gap for some workers. Generally, though, Timmins says his members would welcome the raising of the retirement age in line with the pension age. In certain professions, such as construction, frontline medical care and education, the raising of the retirement age may be counter-productive and even endanger employees’ health. Other professions, such as the judiciary and Civil Service, may benefit from having experienced employees around for longer. Greece's debt crisis may end up helping Europe in the long run if it pressures governments to start addressing the potentially colossal costs of pensions and healthcare in coming decades. In the boom years of the past decade, racy rates of economic growth and ultra-cheap credit gave governments less incentive to prepare for a looming surge in the retiree population, and they were under little if any financial market pressure to do so. But pension reforms being launched in Spain, France and Greece suggest the Greek crisis is now focusing governments' attention on those problems, and even giving them the political cover to act. Politicians facing voters every few years tend to balk at reforms that compromise their hopes of a return to office but pension age increases would conceivably be harder to reverse than tax hikes. And the pressure is on right now. Street protests last week over plans to raise Spain's retirement age to 67 from 65 show how fast the Socialist government there chose in the face of immediate pressures to take steps that will ease the longer-term financial strains of an aging population. Greece, desperate to convince debt investors that it can fix its ragged public finances, is also considering plans to raise average retirement age to 63 from 61 along with tax reforms and a brief amnesty for tax evaders that may boost notoriously weak government revenues longer term. And in France, President Nicolas Sarkozy is working on more reforms of the pay-as-you-go pension system that could feasibly push retirement age beyond a current average of 60, in addition to other structural cost-cutting steps such as non-replacement of one in two retiring civil servants. Our looming debt crisis is mostly a looming entitlement crisis. And our looming entitlement crisis is a looming retirement crisis. But the worry is not merely that 80 million baby boomers will phase into retirement over the next ten or fifteen years. The worry is also that Americans today spend twice as many years in retirement than in 1970. So we are living longer. That's a good thing, right? Of course it is, but longer post-retirement lives means much higher withdrawals from Medicare and Social Security and potentially Medicaid -- if, for example, our elderly wind up in nursing homes. Governments around the world are looking for ways to delay retirement, and naturally they're facing enormous backlash because the about-to-retire voting bloc is (1) very politically active, (2) flush with disposable income that they can spend on political contributions, and (3) about to retire, and counting on government pensions. But we've raised the retirement age before in the early 1980s, and today I agree with Greg Mankiw when he says: "I hope the president's fiscal commission makes raising the age of eligibility for these programs one of its main recommendations." This comes, of course, with the caveat that moving back the date when Americans receive full entitlements is not a sufficient response to our fiscal challenge. The federal government is projected to add another $9-11 trillion in debt over the next decade. 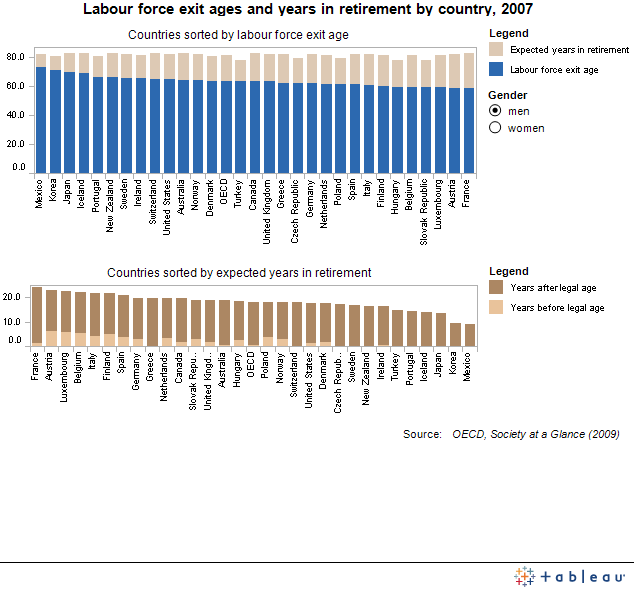 Adjusting the full retirement age is like giving cane to a man with a shattered leg: necessary, but hardly sufficient. A fuller solution might also involve removing tax benefits, adding new taxes, and cutting both discretionary and non-discretionary spending. But adjusting the retirement age is a smart first step, because it closely reflects the underlying reality of growing longevity. Americans' life expectancy isn't carved in stone; it is steadily growing. The same should be said of our retirement age for Social Security and Medicare. Last edited by campbell; 03-10-2010 at 07:23 AM..